Medium Pop Clip Sign Holders are a unique eye catching sign holder that can be used to display pricing, sales messages, policies and more. 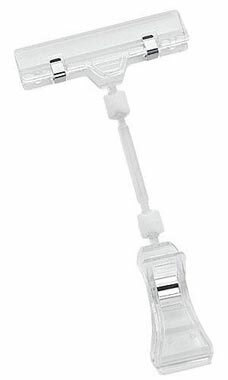 Simply clamp the Pop Clip Sign Holders to clothing racks, shelving, hangrail, or any other secure flat surface. Use with any of our existing signage. Learn more about Signage and Table Display Ideas in the Customer Connection section of our website!